I have been using Safari on my Mac (and iPad) for last 4 years. During those years I moved briefly to Firefox but abandoned it as slower and non Mac looking app. Now comes Google Chrome 8 which I tried last month and have been using since. XMarks - synchronization of bookmarks. What I really like on Chrome browser is the speed, synchronisation of settings between my computers (Windows and Mac) and system of extensions. Safari has extensions as well, but I did not find them very useful. Now, what is needed is Google Chrome on iPad and Nokia phones. A picture is worth thousands words, so here I present a gallery of screenshots From my iPad. Images rotated with free application PhotoPad. How would I change Apple TV? I have love-hate relationship with my new Apple TV. It is incredibly small and quiet multimedia device, yet its content source capabilities are somewhat limited compared to it’s competition. At the cost of £99 this presents itself almost at an impulse buy threshold. So has it delivered the expectations. Read on. Hence my first suggestion is to enable Apple TV to look outside iTunes Home sharing for the content, both on the local home network and on the Internet. I own QNAP TS259 Pro NAS where all my digital content is stored. It supports iTunes (for music only), AFP and Windows sharing and also has DLNA support. Though the last one does not really work well with videos (tested on my PS3). So, I would like Apple TV to be able to connect to the AFP share and start streaming the content. There are load of iPad applications that can do this. Also, if I had Mac Mini this would be very easy to do. So why not Apple TV? I do not want to have my iMac running all the time. My NAS is on always (with some energy settings switched on). Next, the content from the Internet is very limited to iTunes (UK library) and YouTube (there are some restrictions on the content outside USA). Look at competitor, Apple. Why there is no Netflix support in the UK for “all you can eat” packages? Apple TV can connect to my Aperture library and show photos. The interface is quite good. But as I mentioned above, my photos are also on my NAS in the same structure as in Aperture. It would also be good to have more intuitive connection to Flickr. I could authorise Apple TV for Flick access (OAuth protocol would come very handy here) and see my photostream and those of my friends. Moreover, it completely lacks the access to Google Picasa photo service. I guess that the rivalry with Google is behind it. Listening to music is really limited to iTunes or Internet Radio. And it is pity. Why cannot Apple tV connect to Spotify or Napster? Such a functionality would add tremendous value to me as I do not have Sonos or other Spotify compatible Hi-Fi (at least not yet). This is just a short list of tasks that come to my mind. I am sure the list can be much much longer. As Steve Jobs said, the Apple TV is still his hobby; and it shows. I am honestly hoping that Apple is working on a new software that would bring some if not all improvements suggested here. Until then, my Apple TV is going to be used less frequently and may be replaced by a more versatile Mac mini. 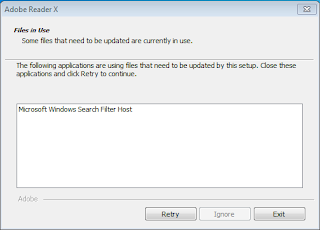 As you may know, there is new Adobe Reader X which bring important security improvements in this bug infested application. Now, what do you think that a normal user would do? Nothing at all! There is no way to close this process as it is not an Windowed application, nor running in a system tray. So what is it then? 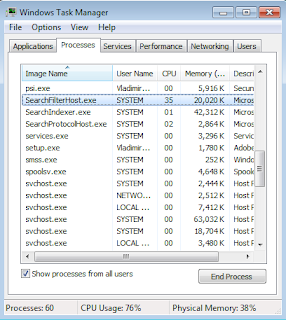 Quick search on Google shows that the process name is SearchFilterHost.exe. And it is running as SYSTEM. As I am administrator on this host I can try "End process". So I did, but the process simply restarts! 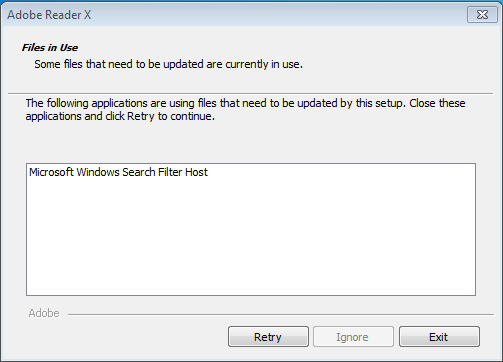 Conclusion: I cannot install Adobe Reader X on my WIndows 7 in normal mode. Is Amazon new DNS service a wise move? Amazon announced the new DNS hosting service (Amazon Route 53) in the cloud today. The link with more details about the service is here. The service is similar to others, except there is one one important security concern for me - billing per usage, as is the case with many other Amazon cloud services. More precisely, 50c per million queries up to 1 billion and then it drops to 25c per million queries. What I feel is that this model might not be very safe for Amazon customers. It may open an avenue for someone malicious to make them pay for something they have benefited from. Let me explain. The reason lies in the nature of DNS and the network protocol it uses, which is UDP. UDP protocol has not security controls built in and it is very easy to spoof UDP packets. By creating a packet where the source IP address belongs to someone else. As the DNS is stateless (only one query and one response) the DNS server simply send the response to the original source IP address. By doing so, millions of packets can be sent by malicious persons in relatively short time and be unrecognisable from those sent by company's customers. Let's take my broadband connection for example - 50Mbps down and 5Mpbs up. If I assume a typical IP packet with a DNS query is around 50 Bytes I can send approx. 12,000 DNS queries per second, theoretically. Let's lower it it to 10,000 to be on the safe side. To hit a million of queries should take me around 100s (close to 2 minutes to approximate again). That means that every 2 minutes can cost a company using Amazon DNS service 50c (and that is just using one computer behind a cable modem!). Now imagine a DDoS attack if someone wants your company to bleed cash. Let's assume I want your company to pay for DNS $1000 per month. I need to generate 3 billion DNS packets. That will take me approx 85 hours using just my Mac; easily done in few hours with many PCs hosting remotely controlled malware! Of course, Amazon could put in place some kind of DDoS protection. Or could they? DSN packets can be spoofed and there is no way to tell the difference from the legitimate customers. Another option is for a company to restrict how many queries they want to limit per month, but that could easily be used by criminals to reach the limit quickly and starve legitimate customers of DNS data. In short, I would stay far away from Amazon DNS service in the current offering, unless they update the pricing model to offer "all you can eat" DNS service. Use Google Picasa for Pictures and Mozy free service for documents or Dropbox for seamless synchronisation between multiple computers. 4. One the Picasa client find all pictures toggle the "Sync to Web" and sign in with the Google account. The amount of space that comes with free Picasa service is "just" 1GB. This might not be enough for all, so I say - upgrade storage. For $5 per year you get 20GB, and $20 gets you 80GB. That is pretty good value in my opinion. Get free Mozy or Dropbox. Both give 2GB of free storage. The difference is that with Mozy you do not need to think of any setup and where you save documents. With Dropbox, you need to save files to the Dropbox folder to get them uploaded to the cloud. Warning US citizens, your Internet freedom is about to disappear! Most people connected to the Internet enjoy freedom to see what they want, visit sites they want and generally roam freely. That is, all except citizens of states such as China, Iran, and others. And soon, you might be want to add USA to the list. Shocking, isn't is? The country that invented the Internet is now taking legal steps to enable sites to be put on a mandatory and a suggested black-lists respectively. All in the name of media content companies that do not want to change their attitude to digital content; but that is another topic I guess. Let's hope that the bill does not passes to the law. But if it does, what can ISPs do to enforce it and what can tech savvy people (and criminals to be honest) do to go around the restrictions? ISPs could update their DNS servers to simply return false responses to DNS queries from their clients. Analysis: Probably very easy to implement but not much effective unless DNS traffic from clients to other DNS servers is blocked as well. They could also block IP access to those DNS names, i.e. if www.devil.com resolves to 3.34.2.5 IP address, this could be blocked. Analysis: Very effective but requiring dynamically change access lists based on DNS queries. This would have impact on the performance. Let's assume the blacklist contains DNS hostnames or domains and all DNS servers in the USA must honour the list. In that case, I can simply use my own DNS server (even locally on my computer), use DNS servers of someone outside USA. It would be interesting what OpenDNS would do here, i.e. if they were obliged to do this filtering for all DNS queries coming from USA IP address space. Next obvious option is using VPN. I could setup a VPN server outside USA and connect to it from my computer. Another variant could be reverse/anonymous proxies. This bill is a very very bad idea and I hope it does not pass. Because if it does, EU might be stupid enough to follow the suit and we could kiss goodbye to our Internet freedoms and be forced to go underground. What are you opinions on this topic? I am selling Seagate Blackarmor NAS I bought three days ago! Why? Well, basically I did not do enough research. This NAS looks good but that's about the only thing it does well. For one it does not support Mac, which is very big concern for me. I need a NAS that can work with Mac AFP protocol, support iSCSI, support TimeMachine AND encrypt volumes at the same time. Seagate, as it seems, only supports the latter. The integrate looks so 2000 with basic HTML. Compare it to QNAP's Ajax driven interface. One more nail to the coffin - the DLNA streaming to my PS3 does not work. Yes, you guessed, I am selling Seagate and buying QNAP, 259 Pro specifically. So Seagate, come to your senses and produce something that is not just for Windows users and works well for media streaming. One registry key and what a mess it does to Windows! In my network I have several computers and servers, most Windows (XP SP3 and Win7). About two months ago I started noticing strange behaviour across some PC and 1 server. 1. Windows Update Service stopped downloading updates. 2. McAfee Total Protection SaaS client stopped downloading updates with an error message: Component's digital signature cannot be verified. Looking at the registry entry (HLM\Software\Policies\Microsoft\SystemCertificates\TrustedPublishers)I discovered one particular key that was present only on systems experiencing problems. The problem has gone away as I deleted the key. The systems are working fine now. I had been using Apple Mail functionality to manage my to-dos and tasks. Lately I realised I need to get more organised, i.e. use computer in more sophisticated way and started looking for task management software. First obvious requirement was availability for Mac, iPhone and iPad. This narrowed contenders to merely two: Things and OmniFocus. Both are not cheap, though Things will set you at around half what OmniFocus commands. Will post more when I will have been using it for some time. Back from holidays, refreshed and blogging again. 2. Delete all certificates and import them in the order I want to use them. Come on Apple, even Outlook can do this as well as Thunderbird, which is by the way much better in handling PGP secured emails. Despite technical problems with my rear de-railer which made my bike single speed for last 65km I finished the trail in time, only 1 hour after my friends. See the details from my Garmin 405cx. Can home exam taking be without cheating? There is very interesting article in BBC (see here http://news.bbc.co.uk/1/hi/education/10277993.stm) about new software RemoteProctor (http://www.remoteproctor.com/SERP/) and HW that allows students to take exams at home. Apparently, there are controls to detect sound (microphone), see someone entering a room (video camera) and disabling other software to run on student's computer. But, is it going to be effective? Is it addressing the problem from the right angle? Let me explain. If I wanted to cheat in my room, I would use another computer sitting next to my regular PC. Or I could use my paper notes (yes paper) being just next to the computer as well. So is there a better system? Unlikely, I think, until computer can read the mind and detect cheating, and even better test student without typing anything into the computer. Imagine being tested by reading your thoughts. Guess where this is.... This little flower is making The Michael's Mount near Penzance really gorgeous. Why spend £100 on 3G version of and iPad when I can buy a device for half the price and use any sim card in it? And that is exactly what I did today. MiFi from 3 cost £49 and then I can pay £10 for 1GB per month pay as you go. Moreover, I can share the connection with my other devices that are not 3G enabled. When my 1Gb and month runs out I should look at look at other mobile operators. So, how does it work? Easy, switch on the device that can fit into your pocket and your are on the Internet. Plain easy. However, when I asked staff in Three shop what security MiFi uses for wireless they said it has username and password :). Well, after some googling I found a support article on Three website :) and MiFi supports WPA. Good for me so far. Will see if I need to unlock the device to use another operator's sim card. My new iPad arrived today. So far, I have spent 3 hours playing with it and I am impressed with reservations.